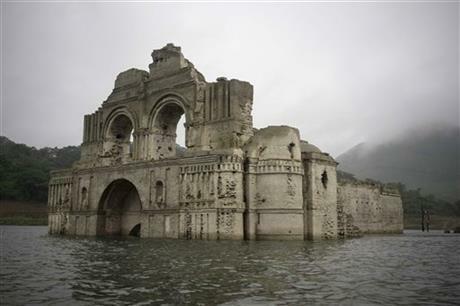 In Mexico, travelers and locals alike are flocking to the Chiapas region to see for themselves a mid-16th century temple that has just resurfaced in the Nezhaulcoyotl reservoir. A recent drought that hit the Grijalva River has dropped the water level by 82 feet, revealing the ruins of this grand relic. Known as the Temple of Santiago, the church was built in a small village called Quechula by monks who intended it to serve what they expected to be a big population. The region didn’t develop as quickly as they planned, however, and the village was abandoned during the plagues of 1773 to 1776. In 1966, a dam was built that submerged the village and its impressive temple under 100 feet of water. This isn’t the first time the temple has made a comeback. In 2002, the water level was so low that locals could actually walk through the ruins. The water hasn’t dropped enough for that today, but locals are still celebrating its reappearance, and local fishermen are offering ferry rides to adventurous tourists who want to walk atop the ruins. Since there’s no way of knowing how long the temple will be around or when it will resurface again, travelers are taking advantage of their luck and earning serious bragging rights. Here are some of our favorite shots of the church from Instagram.